Location: Northwestern Orleans County on Johnson Creek in the Village of Lyndonville. Starting from the intersection of Routes 104 and 63, follow Route 63 (Lyndonville Road) north for 4 miles to the Village of Lyndonville. Find a place to park on the side of the road near the Yates Community Library. From the library walk north to Johnson Creek. The dam will be to your left (west). I know, I know, it is not a waterfall. I have had a few requests to do a web page on it. It is worth taking a look at if your in the area. 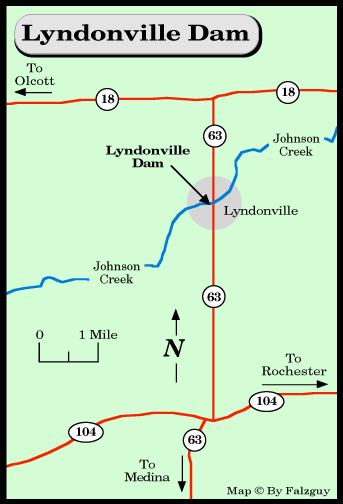 The Lyndonville Dam is 180 feet wide and 9 feet high. The dam faces to the east and has a crest elevation of 316 feet above sea level. 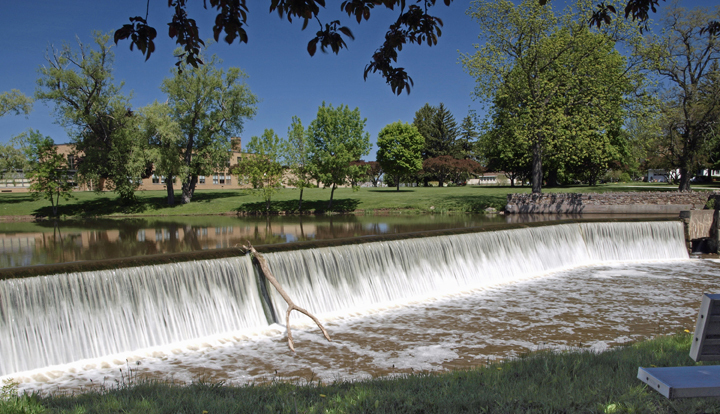 The dam was originally built by early settlers of the area to harness the water power of the creek. Johnson's Creek is named for Sir William Johnson, a British Indian agent. The Village of Lyndonville was incorporated in 1903. It is one square mile in size and and is located in the Town of Yates.